During the creation of Office 2007, 2010 and 2013, a great emphasis was given to the file size. Of course you would like to make the file size as small as possible and for this purpose even the creation or better yet the behavior of Pivot Tables has changed since Excel 2003. The Pivot Table has always created something called Data Cache based on the data provided. The need for indexing and fast creation of analysis has forced it to work in such a manner. 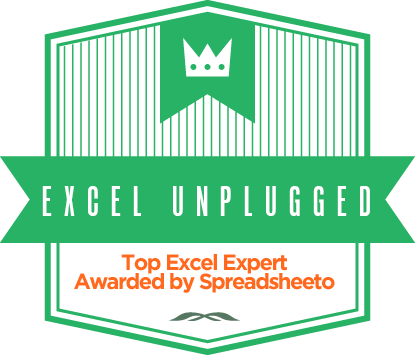 In Excel 2003 each Pivot Table had its own Data Cache but now the Pivot Table that is created using the same Data Model or Data Source as another previously created Pivot Table also borrows that Pivot Tables Data Cache. Therefore, for each new PivotTable analysis that uses the “same” data, Excel saves hard disk space since it does not create its own Data Cache but rather uses the same one as previous Pivot Tables created on the basis of the same Data Model. While this solution is obviously a great way to save space on the computer, this method also has two quite severe consequences for your Pivot Tables. Refreshing one individual Pivot Table consequently refreshes all Pivot Tables that are based on the same data, which can be a great thing but you can easily think of some cases where this would not be such a good thing. The grouping of records within a single field (for example, a Date field that you combine by months or quarters) now cannot be done on an individual PivotTable but immediately effects all the other PivotTables that are related to the same Data Model. If you used this field in another PivotTable, it reflects this grouping instantly. So you’ve lost the ability to group for example a Date field by months in one PivotTable and by Quarters in another. On the left side, find the Pivot Table and Pivot Chart Wizard and with the Add button add the commands to the Quick Access Toolbar. The first step is more or less self-explanatory, but the second one is very important, since it’s the step where we mark the area with the data for the the analysis. 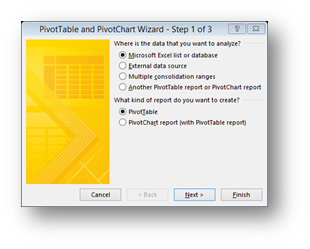 If you select Yes, then the PivotTable will be calculated on the same Data Cache as preexisting Pivot Tables and it will suffer from all the symptoms described above. If you select No, then you will create a new Data Cache for this Pivot Table and therefor it will be separate from the preexisting Pivot Tables! The method is quite simple. Select the PivotTable that you would like to “branch off” and cut it from the workbook and paste it into a new one. Then you only have to copy the Pivot Table back to its original place. Sometimes this is enough, but sometimes you have to close the first workbook and save the new workbook, close it, and then open both workbooks again and copy the PivotTable back into the original spot. The following VBA code does the trick for all the PivotTables in your Workbook. i have 83 pivot tables in my workbook. i don’t know whether the reason is dat. if so, wat can i do? the program terminates with a message that “Excel cannot complete this task with available resources”. and run-time error 1004 is showing. can u help me? You could try closing every other window and trying again, but the real solution is using a 64 bit excel that is not limited by RAM consumption. Sorry for that, had an issue with a WP Plugin… The Visual Basic code is visible now. Thanks for the heads up. Late to the game but I would like to say finding this routine to separate Pivot Caches saved me hours of time. I would make a few additions though. First, I would use “Option Explicit” at the top of the routine. Second, I would dimension the variables r and c as Long. Third, I would add some error handling to the routine. This is because on my instance of Excel, if a Pivot Table does not have a field in the Rows group, it will cause an error when then routine tries to set variables r and c.
I was lucky enough to stumble into option 2 on my own, but in my scenario my data source needs refreshing. When refreshing the data sources for each pivot table – they go back to being linked to the same data cache…. Is there a way to make a pivot table that for eternity will keep its own data cache even if the source expands? 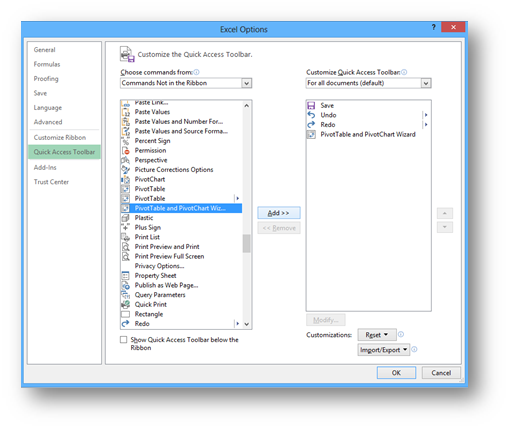 Creating a Pivot Table with the Pivot Table And Pivot Chart Wizard option, will always keep pivots separated. I’m looking for a macro that does the opposite. I created a worksheet with dozens of pivot tables, but at the time of creation I didn’t know that to adjust them using slicers that I would have needed to click “Add this data to the Data Model”. Is there a way to add previously created pivot tables and charts to the existing data model? 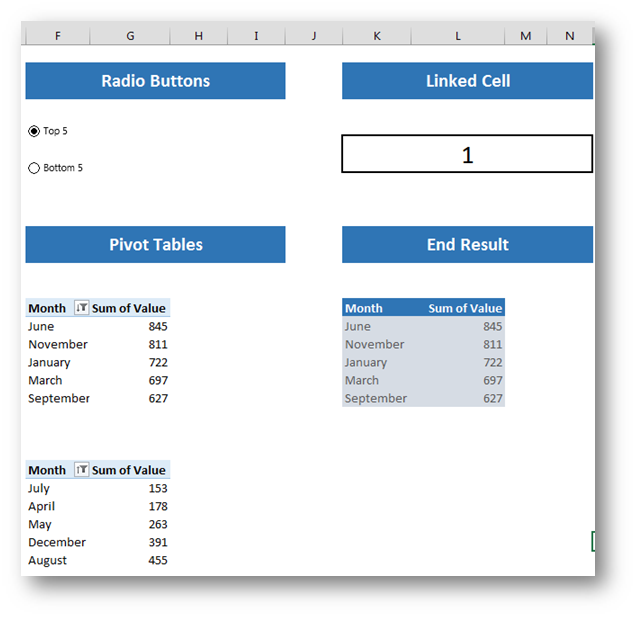 I tried Method 3, as I have a template workbook with some customed Pivot Tables.